After a deep sleep we were on our way into Ivanhoe for their traditional Sunday morning coffee and breakfast. The owner of the café was a marvel in himself. Joy introduced me briefly as their friend from England and an hour later as we are leaving he waves goodbye from the top of the road 'Pleasure to meet you Maz, good luck on your travels!' Now THAT is customer service. I don't think I would even be able to point him out on the street let alone tell you his name, yet there he was waving me off on my mini trip after only having briefly meet me an hour earlier. Automatic smile. After a little drive down to drop Mikey off to be fitted for his suit, we drove around the North Easten suburbs before heading back home to do some washing, grab a spot of lunch and pack up ready for the next leg of the adventure. I could have stayed for ever (figuratively speaking of course - not to worry Joy and David!). They all had such a great lifestyle, one which I could have easily adopted but no time for that, a plane awaited. They kindly dropped me off at Melbourne airport and there I finally was, the start of my 'Walkabout'. Checking in was hilarious! 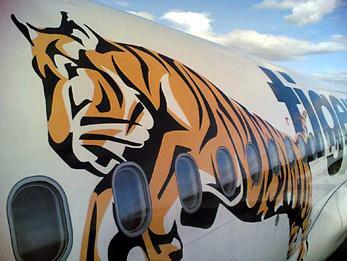 I had booked with 'Tiger airways' (Australia's Ryanair - but worse). I should have known to expect 'budget' treatment when I booked it. The internet quoted $45 (excellent she thought!) then $8 for the seat, the $x for doing it online, $x for paying with a card... $114 later I had a seat to Cairns. With that in mind, what awaited me at the airport should have been no surprise. There was a queue which started at the entrance to the terminal which lead to the security desk and then a mini roped off queue IN the first queue to check in baggage. Although there was no one checking baggage in there I was standing there for 30 minutes as a poor family, carrying two babies and a few bags had to unpack and repack everything to avoid paying $60 in fees for being 4kg over the limit. I KNEW I was more than 4kg over the limit but having bamboozled every other airport I have travelled through so far with carefully placed feet or by balancing my bag on various other objects while it was being weighed, I thought I would try my luck here. As I approached the man at the desk I plastered on my sweetest smile and tried not to grimace too much as I dragged my bag across the floor, giving the impression it was light as a feather. As I stood in front of him my gaydar went off and i flew into action. Using my finley tuned womanly wiles I managed to distract him enough with talk of Valentine's Day, my love of Melbourne and my terrible Aussie accent. It worked, the scales were screaming 24.7kg as my bag went fly off into the belly of the plane and I walked off with my $60 safely in my pocket. Wohoo!! The Tiger Airways terminal is nothing to write home about, so I won't. The flight was also non descript and uncomfortable. I learnt that if I shouted 'bomb' I would get fined and refused on the flight and I also learnt that a shark weighs the same as 115 suitcases... maybe not my suitcases though. On arrival in Cairns I was welcomed by a blast of hot air, a Nomads minivan being driven by Beavis and Butthead and a very nice hostel room. First night alone - done.